It is in two main parts. The first is aimed at complete beginners to introduce the whole idea of programming. It shows how to get some simple examples working and introduces some HTML5 as needed to make a platform for running the examples. It covers some general programming concepts such as writing requirements and testing against them. Part 2 is a more systematic exposition of the language, up to some of the more recent capabilities such as local storage and image processing. That link is to a contents page so that those who already know some of it can jump in to any particular topic of interest. wow that's impressive. thanks for sharing. 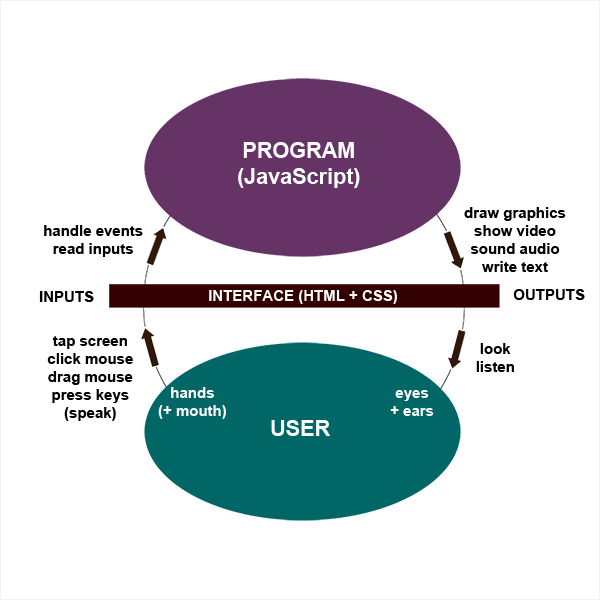 @grelf I like that diagram, used a very similar one several times in presentations, mostly pinched from Andre Staltz https://cycle.js.org/dialogue.html Great way to illustrate HCI and functional purity by generalising both parts of the system (Computer/Program and Human) as I/O devices.